This recipe comes with deepest apologies to the pastor of St. John’s Presbyterian Church. 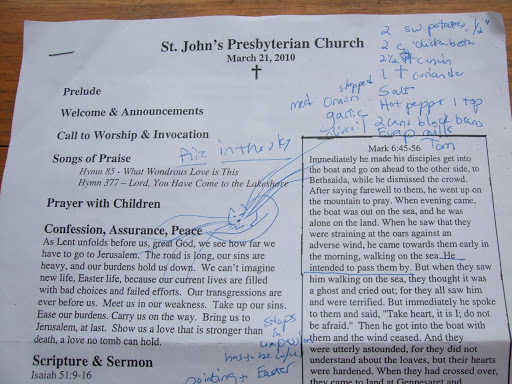 Last Sunday, as Fred and I sat dutifully in worship, I wrote out a new recipe for a sweet potato and black bean soup on the church bulletin instead of thinking about Mark 6:45-56 and Jesus walking on water. Some might say I should apologize to God instead of the minister for this kind of behavior. But God knows better than anyone that while you can always get a copy of the sermon, you can’t always remember a good recipe idea. And if you want proof that God favors those who care about food, I discovered the North Carolina Sweet Potato recipe contest while I was doing a little online research for this blog posting, just in time to enter the contest before tomorrow’s deadline. Frankly, I don’t see how the judges can NOT pick a recipe that was originally written out on a church bulletin (even if that bulletin serves as proof that the recipe creator was not paying very much attention to the sermon). The idea for the dish was not actually triggered by anything in the service but by a recent potluck dinner, where one of the guests brought a dish with sweet potatoes, black beans, rice and chicken. I had been wanting to make something interesting with the Carolina Ruby sweet potatoes sitting on my counter, the only ones from Whole Foods that were under $2 a pound. My constant carping about Whole Foods and their prices aside, our unit on Ninth Street is certainly a friend to North Carolina’s sweet potato farmers–a good thing, since the state produces forty percent of the sweet potatoes grown in the US and is the country’s number one producer. On any given day the store will feature up to five different varieties, including purple ones. We’d already enjoyed two of the Carolina Ruby potatoes served mashed with a little butter, but the remaining two deserved a more exciting end. 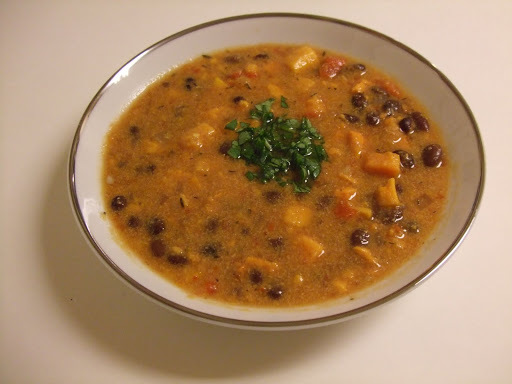 Here’s what I came up with–a combination based in part on the potluck dish and part on a Cuban-style black bean soup I’d tried years ago. The dish is unexpectedly but pleasantly spicy, which complements the sweetness of the potatoes. To me it’s a welcome change from our Southern tendency to smother these wonderful vegetables with sugar and pecans. 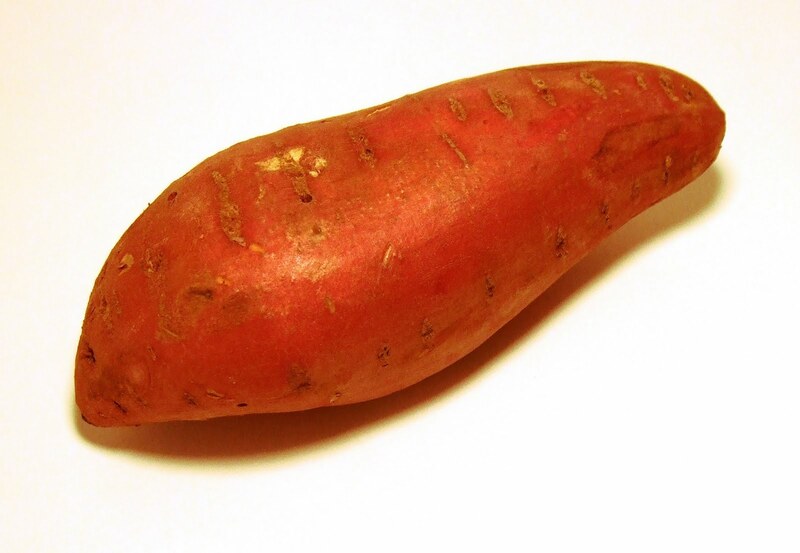 After all, there’s a lot more to a sweet potato than the sweet. Here’s hoping the North Carolina Sweet Potato Commission will like this recipe as much as we did. Heat oil on medium high heat in large pot. Saute onions until translucent, about 3 minutes. Add garlic and stir. Add sweet potatoes, broth, and spices. Cover and turn heat to high, bringing to boil. Reduce heat to medium low and simmer until potatoes are becoming tender, about 5 minutes. With potato masher, mash potatoes briefly, crushing into smaller pieces but not pureeing–there should still be distinctive pieces of sweet potato in the soup, but crushing them will distribute the flavor throughout the dish. Add remaining ingredients except evaporated milk. Cover and cook until potatoes are very tender, 5 – 10 more minutes. (At this point, soup can be frozen. When ready to serve, thaw and finish according to instructions.) Add evaporated milk. Cover and continue to simmer until flavors are blended, about 45 minutes to 1 hour. (The soup’s flavor continues to improve the longer it sits and is better the next day.) Correct seasonings and garnish with cilantro if desired. Let cool slightly before serving. Many thanks for this divinely inspired recipe. This is incredibly good. Lime juice lifts it into best-in-show territory. PS: I used the last of my Covington potatoes, which wintered over very nicely. Only tomatoes I had were K-Roger Italian style, diced. Spice proportions: spot-on! Thanks for the compliments, Greg. Glad you enjoyed it! Have never tried Covington potatoes . . .
you might try King's Red & White for a break from Whole Paycheck. Nicest people in the world.